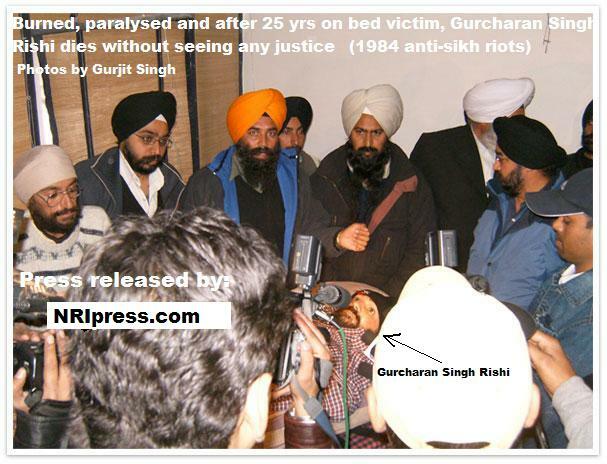 Gurcharan Singh Rishi, victim of anti-sikh riot, 1/2 burned body- became paralyzed, died on Monday at his Mohali residence without seeing any justice. He was a key witness against former union minister Sajan Kumar. He was lying on bed since last 25 years at the resident of his two brothers, Mohali, near Chandigarh. 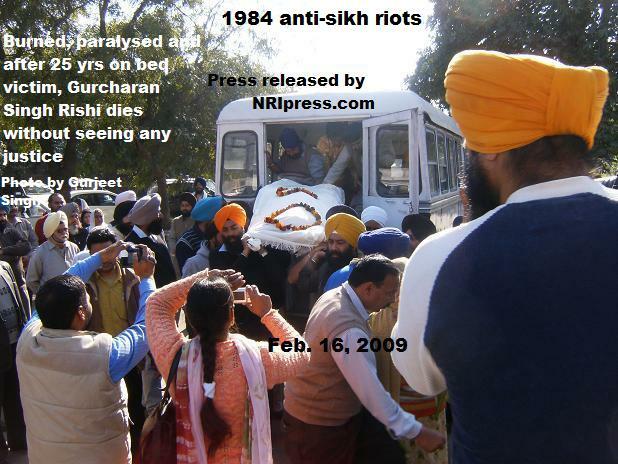 During the 1984 anti-sikh riots in Delhi, he was thrown in a burning vehicle in front of his house in Uttam Nagar. He said he was suffered because of Sajan Kumar, who led the mob. The mob led by Sajan Kumar, started hitting his father and his maternal uncle. His uncle Santokh Singh died on the spot. All his family started hiding in the house but his brother injured. His father and he was taken to the Ram Manohar Lohia Hospital. They discharged without much medical. Due to this reason, he still has many open wounds on his legs and knees. He registered an FIR in Delhi and Mohali a couple of times, but no one listened to them. He did not a get a single rupee as compensation from Indian Govt. His family approached the All-India Sikh Student Federation (AISSF) president Karnail Singh Peer Mohammad. Through him, he told media persons that he saw Sajjan Kumar inciting his henchmen at Nawada in Delhi, who later burnt a Gurdwara Singh Sabha, Mohan Garden, where his father was the president and also properties of many Sikhs. Interestingly, he struggled for getting compensation of Rs two lakh from Punjab Govt but all in vain. According to Gurcharan, Peer Mohammed of Federation, put a pressure on Govt and then CBI recorded his statement in April 2008 in Sajan Kumar's case.